LOADED, ULTRA RARE- Technology Plus & A-Spec Package. Low miles, excellent condition throughout.CERTIFIED Pre-Owned 2016 Acura ILX 2.4L FWD 8-Speed Dual-Clutch 2.4L I4 DOHC i-VTEC 16V. Bellanova White Pearl / Ebony Interior.Clean CARFAX One-Owner.Recent Arrival! 25/36 City/Highway MPGAwards:* 2016 KBB.com Best Buy Awards Finalist * 2016 KBB.com 5-Year Cost to Own AwardsReviews:* The Acura ILX features classic sport sedan proportions- an elongated hood with a short rear deck. An upward-sweeping character line stretches from the front fender to the muscular haunch. 17-inch aluminum alloy wheels are standard on all models and complete the sporting look. Jewel Eye LED headlights are standard, providing a whiter light for better visibility. The ILZ is powered by a 2.4L 201hp i-VTEC 4-cylinder providing 25 MPG city and 36hwy. . The available Acura/ELS Surround Premium Audio System fills the car with surround sound from its 10 speakers from any stereo digital source. The centerpiece of the Technology Package, the Acura Navigation System, in conjunction with AcuraLink provides navigation on an 8-inch screen, mounted high in the center control panel for easy visibility. CARFAX One-Owner. Clean CARFAX.Certified Pre-owned 2015 Acura RDX Technology Package AWD - 3.5L V6 SOHC i-VTEC 24V in Kona Coffee Metallic with Parchment Leather Interior.Recent Arrival! 19/27 City/Highway MPGAcura Certified Pre-Owned Details:* Roadside Assistance* Transferable Warranty* 182 Point Inspection* Limited Warranty: 12 Month/12,000 Mile (whichever comes first) after new car warranty expires or from certified purchase date* Warranty Deductible: $0* Vehicle History* Includes Trip Interruption and Concierge Services* Powertrain Limited Warranty: 84 Month/100,000 Mile (whichever comes first) from original in-service dateAwards:* 2015 KBB.com 10 Best Luxury Cars Under $35,000For more information, visit www.kbb.com. Kelley Blue Book is a registered trademark of Kelley Blue Book Co., Inc.
CARFAX One-Owner. Clean CARFAX.Certified Pre-owned 2016 Acura RDX AWD w/Technology Package AWD 6-Speed Automatic 3.5L V6 SOHC i-VTEC 24V AWD. Graphite Luster Metallic with Ebony Leather Interior.Recent Arrival! 19/28 City/Highway MPGAcura Certified Pre-Owned Details:* 182 Point Inspection* Roadside Assistance* Vehicle History* Warranty Deductible: $0* Powertrain Limited Warranty: 84 Month/100,000 Mile (whichever comes first) from original in-service date* Includes Trip Interruption and Concierge Services* Transferable Warranty* Limited Warranty: 12 Month/12,000 Mile (whichever comes first) after new car warranty expires or from certified purchase dateAwards:* 2016 KBB.com 10 Best Luxury Cars Under $35,000 * 2016 KBB.com 5-Year Cost to Own Awards2016 Kelley Blue Book Brand Image Awards are based on the Brand Watch(tm) study from Kelley Blue Book Market Intelligence. Award calculated among non-luxury shoppers. For more information, visit www.kbb.com. Kelley Blue Book is a registered trademark of Kelley Blue Book Co., Inc.
CARFAX One-Owner. Clean CARFAX. Certified. Crystal Black Pearl 2016 Acura MDX 3.5L AWD AWD 9-Speed Automatic 3.5L V6 SOHC i-VTEC 24V Parchment w/Leather-Trimmed Interior. 18/26 City/Highway MPGAcura Certified Pre-Owned Details:* Warranty Deductible: $0* Transferable Warranty* Roadside Assistance* Includes Trip Interruption and Concierge Services* Vehicle History* Limited Warranty: 12 Month/12,000 Mile (whichever comes first) after new car warranty expires or from certified purchase date* Powertrain Limited Warranty: 84 Month/100,000 Mile (whichever comes first) from original in-service date* 182 Point InspectionAwards:* 2016 KBB.com Best Buy Awards Finalist* 2016 KBB.com 5-Year Cost to Own AwardsReviews:* The Acura MDX is as refined as it is sophisticated. The MDX comes standard with a 3.5L 290hp V6, i-VTEC engine, which gets an EPA estimated 19 MPG City and 27 MPG Highway for FWD models and 15/27 for SH-AWD models. It has a 9-Speed Sequential SportShift Automatic and the ability to switch to manual control where you can change gears with paddle shifters. The MDX comes standard with a very generous assortment of features. Some of the items are the Multi-View Rear Camera, Anti-lock Brakes, USB iPod Integration, Vehicle Stability Assist, Bluetooth HandsFreeLink, and a Power Tailgate. SUPER HANDLING ALL WHEEL DRIVE (SH-AWD)Clean CARFAX, One Owner. Acura Certified. Graphite Luster Metallic 2016 Acura MDX 3.5L AWD AWD 9-Speed Automatic 3.5L V6 SOHC i-VTEC 24V Ebony w/Leather-Trimmed Interior. 18/26 City/Highway MPGAcura Certified Pre-Owned Details:* 182 Point Inspection* Roadside Assistance* Limited Warranty: 12 Month/12,000 Mile (whichever comes first) after new car warranty expires or from certified purchase date* Powertrain Limited Warranty: 84 Month/100,000 Mile (whichever comes first) from original in-service date* Vehicle History* Warranty Deductible: $0* Transferable Warranty* Includes Trip Interruption and Concierge ServicesAwards:* 2016 KBB.com Best Buy Awards Finalist * 2016 KBB.com 5-Year Cost to Own AwardsReviews:* Generous number of features for the money; adept handling; good fuel economy; confident acceleration; quiet cabin; excellent crash-test scores. Source: Edmunds* The Acura MDX is as refined as it is sophisticated. It is adorned with gorgeous Jewel Eye LED Headlights, which are designed to help improve reaction times and lessen eyestrain. With SUVs and Crossovers, keeping vehicle weight low is. The MDX comes standard with a 3.5L 290hp V6, i-VTEC engine, which gets an EPA estimated 19 MPG City and 27 MPG Highway for FWD models and 15/27 for SH-AWD models. It has a 9-Speed Sequential SportShift Automatic and the ability to switch to manual control where you can change gears with paddle shifters. The MDX comes standard with a very generous assortment of features. Some of the items are the Multi-View Rear Camera, Anti-lock Brakes, USB iPod Integration, Vehicle Stability Assist, Bluetooth HandsFreeLink, and a Power Tailgate. Optional packages give you amazing items as well. Rare SH-AWD model with Acura Watch Plus Safety Suite.AcuraWatch Plus Package Includes:* Adaptive Cruise Control (ACC)* Collision Mitigation Braking System (CMBS)* Lane Keeping Assist System (LKAS)* Forward Collision Warning (FCW) system* Lane Departure Warning (LDW) system* Road Departure Mitigation SystemCARFAX One-Owner. Clean CARFAX. Certified. Crystal Black Pearl 2016 Acura MDX 3.5L AWD AWD 9-Speed Automatic 3.5L V6 SOHC i-VTEC 24V Ebony w/Leather-Trimmed Interior.Recent Arrival! 18/26 City/Highway MPGAcura Certified Pre-Owned Details:* Transferable Warranty* Limited Warranty: 12 Month/12,000 Mile (whichever comes first) after new car warranty expires or from certified purchase date* Roadside Assistance* Warranty Deductible: $0* Powertrain Limited Warranty: 84 Month/100,000 Mile (whichever comes first) from original in-service date* 182 Point Inspection* Vehicle History* Includes Trip Interruption and Concierge ServicesTailgate. CARFAX One-Owner. Acura Certified.2016 Acura MDX 3.5L SH-AWD AWD 9-Speed Automatic 3.5L V6 SOHC i-VTEC 24V.Graphite Luster Metallic with Ebony w/Leather-Trimmed Interior.Recent Arrival! 18/26 City/Highway MPGAcura Certified Pre-Owned Details:* Vehicle History* Roadside Assistance* Transferable Warranty* Limited Warranty: 12 Month/12,000 Mile (whichever comes first) after new car warranty expires or from certified purchase date* 182 Point Inspection* Includes Trip Interruption and Concierge Services* Warranty Deductible: $0* Powertrain Limited Warranty: 84 Month/100,000 Mile (whichever comes first) from original in-service dateReviews:* Generous number of features for the money; adept handling; good fuel economy; confident acceleration; quiet cabin; excellent crash-test scores. Source: Edmunds* The MDX comes standard with a 3.5L 290hp V6, i-VTEC engine, which gets an EPA estimated 19 MPG City and 27 MPG Highway for FWD models and 15/27 for SH-AWD models. It has a 9-Speed Sequential SportShift Automatic and the ability to switch to manual control where you can change gears with paddle shifters. The MDX comes standard with a very generous assortment of features. Some of the items are the Multi-View Rear Camera, Anti-lock Brakes, USB iPod Integration, Vehicle Stability Assist, Bluetooth HandsFreeLink, and a Power Tailgate. New vehicle pricing includes all offers and incentives. Tax, Title and Tags not included in vehicle prices shown and must be paid by the purchaser. While great effort is made to ensure the accuracy of the information on this site, errors do occur so please verify information with a customer service rep. This is easily done by calling us at 888-923-3750 or by visiting us at the dealership. 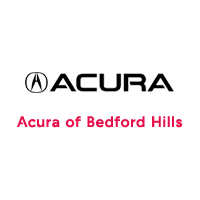 Acura of Bedford Hills	41.2262146, -73.7127822.